Schematic overview of the integrated climate risk assessment framework showing the key steps and components required (Figure 3, Page 4 of the brief). The impacts of climate change are being observed all across the Indian Himalayan Region (IHR). The natural resources and communities in the region are facing high risk of getting adversely affected due to current and future impacts of climate change. The livelihoods of communities, which are largely dependent on natural resources, are getting impacted. This necessitates planning and implementation of suitable adaptation strategies and interventions in the region. However, the main challenge is to identify strategies which are most appropriate to reduce climate vulnerability. Identifying areas or communities which are most likely to get affected can help in planning and implementation of suitable adaptation strategies. Climate risk assessments can contribute towards planning for adaptation in IHR. Such assessments can help in identifying hotspots which can be further used for prioritizing interventions. However, clarity in concepts is required for conducting a climate risk assessment. There is no single approach for doing a climate risk assessment because climate-related risks are wide-ranging, and approaches must be tailored to specific local conditions. Yet, use of a common framework for climate risk assessment allows a comparison across different regions thus helping in prioritizing investments. This science brief explains the key terminologies related to climate risk assessment. The purpose of this brief is to provide a general guidance on conducting a climate risk assessment in the IHR. This document has been developed on the basis of experiences gained from a pilot study on integrated assessment of climate vulnerability, hazards and risk for Kullu district, Himachal Pradesh, India conducted under the Indian Himalayas Climate Adaptation Programme (IHCAP), a project of the Swiss Agency for Development and Cooperation (SDC). The application of an integrated risk assessment framework requires three components - hazards, vulnerability and exposure. Within the conceptualization of climate change-related risk, vulnerability is clearly linked to the intrinsic conditions of a society or system, while the changes in the climate system contribute to hazards and trends. 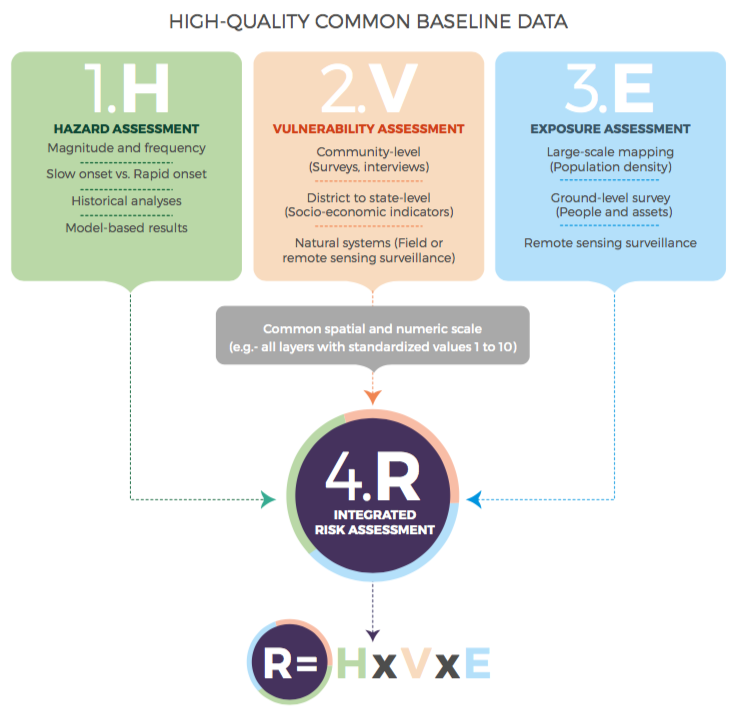 Information from the three components of risk needs to be aggregated to a common scale for developing a risk profile of the region. Baseline data: The selection and acquisition of common baseline data (climate, socio-economic, environmental, etc.) is the most important ingredient for an integrated climate vulnerability, hazards, and risk assessment. There are two key requirements regarding common baseline data: 1) an agreed reference time window which defines the current (e.g., 1980 – 2010) or the future (e.g., 2050 – 2100) conditions, and 2) agreed datasets from common sources. This enables the various contributing studies and assessed components to be brought together and compared, providing a robust scientific basis for climate adaptation and policy recommendations. Long-term baseline data for climate and hazards can be particularly useful to understand long-term trends and patterns, and assess future threats. Integrated risk assessment: A robust assessment encompassing all three core components of hazard, vulnerability, and exposure is required to provide the necessary evidence to support adaptation planning. The use of an integrated framework provides for assessments which combine concepts and approaches from both climate change adaptation and disaster risk reduction, and contributes to efficient planning for development. Consultations to translate scientific assessment to adaptation: Addressing climate change and reducing vulnerability to climate change in IHR requires a multi-stakeholder approach involving policymakers, planners, scientists/researchers and practitioners. It is essential to connect the scientific assessments with the perceptions of local communities and with the priorities of the government departments. This can be achieved through extensive consultations with local communities and the government departments which will enable translation of the findings of the scientific assessment into evidence-based adaptation planning and implementation. Evidence-based planning and implementation: There is a need for evidence-based planning and implementation of adaptation strategies to ensure their sustainability in the long term. Evidence-based planning strives for the implementation of sound adaptation strategies that address both the environmental and societal drivers of climate risk. It also helps in identifying the most vulnerable sections of the society.